Take a break from rowing to pull tractors, saw tree trunks and race in wheelbarrows at Argo. The Farmer Challenge, a kind of ‘clumsy farmer’s games’, is part of the 105th anniversary celebrations of the rowing association. Argo is celebrating its lustrum week. ‘Now that everyone’s holidays have started, we are organising a week of great activities’, says chair of the lustrum committee Harm Brouwer. 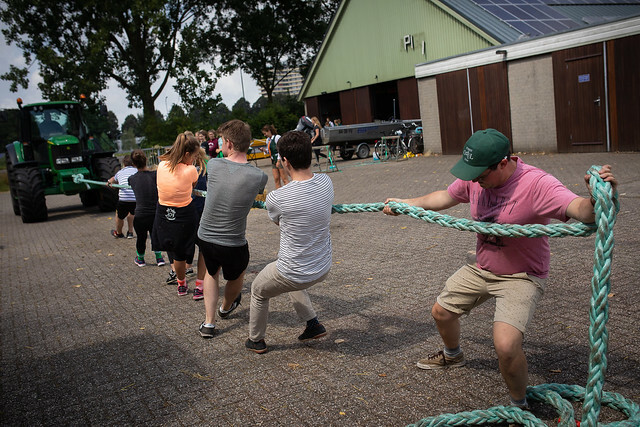 ‘These include parties, brunches, a family day and survival runs.’ The Farmer Challenge on Wednesday 10 July was part of the programme.